If you haven’t seen unicode-math or really understood what it does, see the image below for one of its features. Writing maths like this isn’t any faster than using normal LaTeX commands, but it sure makes reading and editing the stuff far easier. Compare this with the Mathematica programming language, say. There, it allows you to write programs with either variable names or mathematical symbols; for many purposes, using the symbols increases the readability and maintainability of your code. I think the same thing applies for writing LaTeX documents. Using symbols certainly isn’t always better, but I think that sometimes it will be. 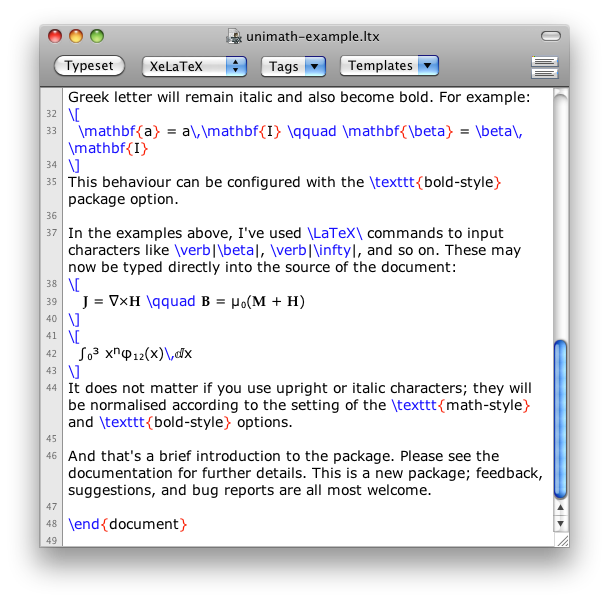 And it sure helps to make LaTeX source look less intimidating to a new user, don’t you think?